In building our collection we try to paint a comprehensive picture of industrial work in Nova Scotia and its impact on our people over time. We collect a wide range of artifacts to cover as many angles as possible. We acquire products of Nova Scotia industry and the tools used to make them. We also try to capture the social dimension of industrial life as new technologies and new ways of working change our lives. We collect objects to assist Nova Scotians in understanding their past and present. We want to know about the machines used, the workers who used them, the things that were made, the changes in technology over time, and the role of industry in modern life. All of these objects make up a collection, “the industrial collection”. Since our museum is part of the Nova Scotia Museum family of 27 museums, our collection is part of the provincial collection. This collection belongs to the people of Nova Scotia. It has been built over 140 years largely thanks to the generosity of individual donors. The Museum of Industry started building its collection in 1986 before the museum in Stellarton was erected. Some artifacts were transferred to our care from the collection of the Nova Scotia Museum and new items were acquired, mostly through donations from individuals and companies. We decide if we will accept an object into our collection based on the themes that fulfill our Purpose and we follow the Nova Scotia Museum’s collection policy. What to collect is a very important decision because we are making a commitment to care for each object forever. We are still adding to our collection to preserve and tell the important stories of Nova Scotia’s industrial heritage. We collect artifacts about industry and work in Nova Scotia, past and present. A lot of the collection is about resource extraction (mining, lumbering) and especially manufacturing, but we also want to know about more modern industries, such as services (hair styling, and dentistry to name a couple), and knowledge-based industries (usually technology-based). 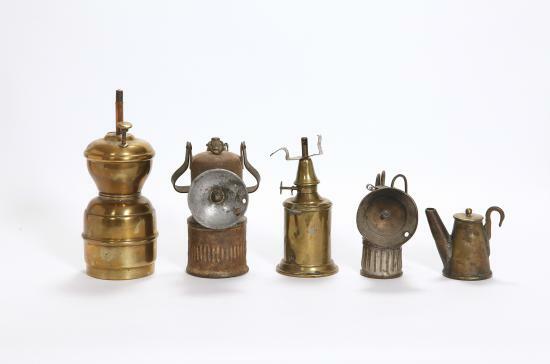 Our collection of over 30,000 items is as varied as it is large. It includes some Really Big Things, like locomotives, and Really Small Things, like printing type. Themes and topics represented in our collection include: products of NS industry, tools and machinery, the age of steam, technology and everyday life, industry in art, work clothes, railways, labour unions, the impact of industry on the environment, and women’s changing role. To see a bit more about these artifacts, click on the themes.